The migration of T cells into extravascular sites of inflammation is regulated by information derived from the molecular structure of the invaded tissue and from chemokine and cytokine gradients in the context of the extracellular matrix (ECM). Although recent studies have highlighted the role of particular chemoattractants in leukocyte migration, to date little is known about how specific combinations of contextual signals control the migration of leukocytes and their localization at sites of inflammation. Here we studied the interplay between a pleiotropic cytokine, TNF-α, and two prototypic chemoattractants, RANTES and stromal cell-derived factor-1α (SDF-1α), on human CD45RO+ T cells migrating within an ECM-like context. For this purpose, we used a newly constructed three-dimensional gel system designed to follow, in real time, the migration of individual leukocytes along chemotactic gradients in vitro. We found that TNF-α, which binds the ECM protein fibronectin and lacks adhesion- and migration-promoting effects of its own, can act as a proadhesive cytokine on T cells exposed to RANTES and SDF-1α. Furthermore, fibronectin-complexed TNF-α provided anchorage signals to the T cells as they moved directionally along chemoattractive gradients. This effect of TNF-α required an intact TNF-α receptor II subtype on the migrating T cells. The anchoring effect of TNF-α appears to be specific; IL-2, an integrin-activating proadhesive cytokine, does not transmit stoppage signals to T cell migration induced by RANTES. Thus, TNF-α present in the ECM at sites of inflammation may function to anchor T cells recruited to these sites by chemotactic signals. The migration of immune cells to sites of inflammation requires the activation of cells, the mobilization of functional adhesion receptors, and the expression and secretion of cytokines (1, 2, 3). The navigation of leukocytes from the vasculature into inflammatory sites depends on 1) the migrating cell type, its state of activity, and the existence of other cell types in the vicinity; 2) the combination of proinflammatory signals in the form of cytokines, chemokines, and acute phase reactants; and 3) the molecular architecture of the extracellular matrix (ECM).3 The ECM, which provides a physical barrier between cells and tissues, can also provide a binding site for diverse immunomodulatory signaling molecules, such as IL-2, TNF-α, TGF-β, RANTES, and macrophage inflammatory protein-1β (4, 5, 6, 7). These mediators, through their interactions with specific leukocyte receptors, may act concomitantly with ECM-specific integrins to modulate leukocyte activation and migration. During their migration, T cells may encounter, either sequentially or simultaneously, a mixture of several of these modulators (1, 8, 9). Therefore, it is important to understand the reciprocal effects of various inflammatory agents that may act alone, sequentially, or simultaneously on T cells migrating within tissues. We chose to study the effect of a major proinflammatory cytokine, TNF-α, a pleiotropic cytokine found in increased concentrations at sites of inflammation (10), on T cell migration induced by the chemokines RANTES and stromal cell-derived factor-1 (SDF-1). Previously, TNF-α had been shown to act as a specific proadhesive mediator for human T cells in ECM environments (4, 11). Hence, we postulated that TNF-α may affect the navigation of T cells migrating toward RANTES or SDF-1α depots within ECM. Several approaches to determine physiological leukocyte migration, in real time, on ECM-like gels in vitro have been described (12, 13). We have recently developed a three-dimensional (3-D) collagen (CO) gel reconstituted with fibronectin (FN) and laminin (LN), the major adhesive glycoproteins of ECM, to follow and analyze the dynamics of T cells migrating along localized gradients of chemoattractive cytokines within the ECM environment (12). Herein, we studied the effects of localized deposits of TNF-α on the chemotactic motility of T cells moving within ECM toward chemokine depots. We found that although TNF-α lacks proadhesive and chemotactic activities on its own, ECM-associated TNF-α provides T cells with effective stop signals during their migration along chemokine gradients created by T cell chemokines, RANTES and SDF-1α. This is an example of a nonmigratory cytokine, which, when secreted within an ECM environment, can regulate the chemotactic navigation of T lymphocytes toward chemokine sources. The following reagents and chemicals were used: recombinant human IL-2 (sp. act., 18 × 106 U/mg; Chiron, Amsterdam, The Netherlands); recombinant human RANTES and recombinant human TNF-α (PeproTech, Rocky Hill, NJ); human recombinant SDF-1α (R&D Systems, Minneapolis, MN); collagen type I (CO-I) and LN (Cellagen, ICN Pharmaceuticals, Costa Mesa, CA); FN (Chemicon, Temecula, CA); BSA (Sigma, St. Louis, MO); and HEPES buffer, antibiotics, heat-inactivated FCS, sodium pyruvate, and RPMI 1640 (Kibbutz Beit-Haemek, Israel). Ab to human FN was obtained from Calbiochem; rhodamine-conjugated goat anti-rabbit Abs was purchased from The Jackson Laboratory (Bar Harbor, ME); murine mAb to human TNF-α, mAb11, was obtained from PharMingen (San Diego, CA); murine mAb against human TNF-α receptor type I and mAb against human TNF-αR II were obtained from R&D Systems; and murine mAb against human CD45RA, IgG, was purchased from Serotec (Oxford, U.K.). PDLab-Tek chambers (Nalgene, Nunc, Naperville, IL) were used for the T cell migration assays. T cells from human peripheral blood were isolated on a Ficoll gradient, washed, resuspended in PBS containing 3% heat-inactivated FCS, and incubated (45 min at 37°C in a 7% CO2-humidified atmosphere) on nylon-wool (Fenwall, IL) columns, as previously described (12, 14). The nonadherent cells were eluted and washed, and the remaining platelets were removed by centrifuging the cells (1200 rpm, 10 min, 18°C) in PBS containing 5 mM EDTA. To remove monocytes, we incubated the cells (2 h) on tissue culture grade petri dishes. The nonadherent cells were collected, washed, counted, and labeled with a Pan T cell isolation kit containing mAb against CD11b, CD16, CD19, CD36, and CD56. The labeled cells were then passed through separation columns (MiniMACS columns, Miltenyi Biotec). In a second round of purification, CD3+ T cells were labeled with mAb against CD45RA (Serotec), and a magnetically coupled secondary Ab was applied to metal wool S columns. Unlabeled T cells were subsequently collected and analyzed by FACS for CD45RO expression. The purified cells obtained (usually >97% CD45RO+ T cells) were cultured (3 × 106 cells/ml; 18 h, 7% CO2 humidified atmosphere) in RPMI containing 10% heat-inactivated FCS and IL-2 (200 U/ml). Analysis of T cell adhesion to ECM ligands, with or without TNF-α, was determined as previously described (6). Briefly, flat-bottom microtiter well plates were precoated with FN (0.5 μg/well), and the remaining binding sites were blocked with 1% BSA. Next, 51Cr-labeled T cells (105 cells in 100 μl of RPMI containing 0.1% BSA) were added to the wells. Where indicated, PMA (25 ng/ml) was added to the wells together with the cells. The plates were incubated (60 min) at 37°C in a 7.5% CO2 humidified atmosphere and then gently washed. The adherent cells were lysed (1% SDS in PBS), removed, and counted by a gamma counter (Packard, Downers Grove, IL). To determine the adhesive role of matrix-complexed TNF-α, we added the cytokine to the wells (100 μl containing 250 pg/ml; 30 min, 37°C) that had been coated with FN. Unbound TNF-α was removed by washing before adding the cells. The results (±SD) are expressed as the mean percentage of bound T cells from quadruplicate wells for each experimental group. The migration of human T cells was examined in a 48-well chemotaxis microchamber (Neuro-Probe, Cabin John, MD). The two compartments of the microchambers were separated by an FN-coated (10 μg/well) polycarbonate filter (5 μm pore size; Osmonics Proteins Products, Livermor, CA). Where indicated, TNF-α (2 ng/ml) was preincubated (1 h, 22°C) with soluble FN (10 μg/ml), and then the solution (100 μl/well) was used to cover (60 min) the polycarbonate filters. Alternatively, IL-2 (10 U/ml) or TNF-α (250 pg/ml) was added as soluble moieties to the upper chamber 15 min before adding the T cells. To induce T cell chemotaxis, we added SDF-1 (150 ng/ml) or RANTES (100 ng/ml) to the lower wells and added the 51Cr-radiolabeled T cells (105 cells in 125 μl/well) to the upper chambers. After completing the assay (150 min, 37°C in a humidified, 7.5% CO2 atmosphere), the filters were removed, and the number of migrating T cells was determined by the radioactivity recovered in the lower wells (14). T cell migration within ECM-like 3-D gels was performed and analyzed as previously described (12). Briefly, the migration gel medium consisted of RPMI containing CO-I, FN, and LN. Purified CD45RO+ T cells were mixed with a drop of the gel-like medium (drop I; 250 cells in 10 μl), and a second drop (drop II; 8 μl) of the gel was placed 1.5 mm from the first drop (Fig. 2⇓). Next, a chemoattractant depot was created by placing a third drop of the gel-like medium (3 μl), which contained RANTES (100 ng/ml) or SDF-1 (150 ng/ml), 1.5 mm from the second drop and 3–5 mm from the first drop. Once the three drops started to polymerize, the drops were carefully connected (drops I and II first), using a 29-gauge syringe needle, to form a continuous matrix. The slides were placed inside CO2-filled chambers and incubated (35 min, 37°C) to allow the T cells to reach a steady-state dispersion in the gel. Once the three drops started to polymerize, the drops were gently connected to form a continuous matrix. To allow TNF-α to become complexed with FN in the gel, we preincubated the 3-D ECM gels (2 h, 22°C) with 100 pg/ml to 1 ng/ml of TNF-α and the gel was applied to drop II. These preparations are referred to here as ECM-bound TNF-α. In other experiments FN (1 mg/ml) was preincubated (2 h, 22°C) with TNF-α (1 ng/ml), and the complex was introduced into a gel consisting of CO and LN, such that the FN ratio between the ECM components was identical with the standard composition of the ECM-like gels. To investigate the effect of soluble TNF-α on migrating T cells, we applied TNF-α (250 pg/ml) directly to drop II immediately before beginning the assay. T cell migration within these 3-D gels was monitored using an inverted phase-contrast Diaphot Microscope (Nikon, Japan). T cell movement within a selected focal plane of the gel proximal to the slide was photographed with a long integration LIS-700 CCD video camera (Applitech, Holon, Israel) and recorded on a time-lapse video recorder (AG-6730 S-VHS, Panasonic, Japan) at 25 frames/min. T cell locomotion was analyzed manually from played back video segments (12). Time zero was defined as the time at which the cells located at the edge of the test field closest to the chemoattractant source started to spread and polarize in response to the diffusing chemoattractant. Cellular movements were assigned as follows: randomly migrating cells (motile cells that moved randomly in the gel or in a direction away from the chemoattractant) and directionally moving cells (T cells that migrated directionally at least one-third of the screen, within 60 min after the beginning of the assay). For each interval of the assay, T cell movement over a 10-min period was analyzed: the phenotypes designated for 10 min included those obtained by motion tracking between 5 and 15 min, the phenotypes at 20 min, those between 15 and 25 min, etc. The results shown were obtained from experiments in which T cell viability was confirmed at the end of the assay to be >95%. Where indicated, T cells were preincubated (40 min, 22°C) with 250 μl of neutralizing mAb against TNF-α receptors I and II (6 and 1.5 μg/ml, respectively). The treated T cells were then washed and added to the migration gels. Before the migration assay, T cells were washed and placed into the gels with or without TNF-α. Experiments were performed in a 37°C atmosphere that was maintained throughout the entire experiment. T cell migration within the 3-D gels was videotaped upon completing the connections between the three drops and was analyzed as previously described (12). Cell images were converted to computerized movies using Adobe Premiere software (Abacus Concepts, Berkeley, CA) run on a G3 Macintosh computer (Apple Computer, Cupertino, CA). Cell locomotion was analyzed by Dynamic Image Analysis System (Soltech, Oakdale, LA). Individual cells were tracked during the entire period of the assay, and paths of individual cells were digitized and analyzed for total distance (per 1 h), speed (microns per minute), and vectorial distance traveled from their original position at time zero (15, 16). Polarization and T cell shape changes were monitored as previously described (17). TNF-α was bound to the gels at 4°C and the gels were placed on sterile glass coverslips. Next, the complexed matrix was polymerized (45 min at 37°C), and the matrix was fixed (20 min) with 3.5% formaldehyde in PBS. After having been washed with PBS and blocked with 2% OVA in PBS, the ECM gels were double stained (30 min, 4°C) with 1) polyclonal Ab (10 μg/ml) to human FN and rhodamine-conjugated anti-rabbit IgG, or 2) mouse anti-human TNF-α mAb and FITC-conjugated anti-mouse IgG. Finally, we washed the coverslips, which were then mounted onto glass slides and photographed (Kodak TMAX-3200 film, Eastman Kodak, Rochester, NY) using a Zeiss Axiolab microscope (Oberkochen, Germany). Certain proinflammatory cytokines, such as IL-2 and TNF-α, can bind to major ECM glycoproteins and can exert proadhesive effects on T cells (2, 3, 4). Here, we studied the effects of FN-associated TNF-α on human T cell adhesion to FN triggered by RANTES and SDF-1. Purified 51Cr-labeled human T cells were added to wells coated with FN that was precomplexed with TNF-α. The cells were then exposed to the chemokine SDF-1 or RANTES; the protein kinase C (PKC) agonist PMA served as a control T cell activator. The percentage of cells that developed firm adhesion was measured after incubation. The results indicate that TNF-α by itself, when complexed to FN, induces only marginal adhesion of T cells to the ECM glycoprotein (Fig. 1⇓A). In contrast, when it is presented to T cells exposed to either RANTES or SDF-1α, TNF-α substantially augments T cell adhesion to FN, compared with the adhesion triggered by each chemokine alone. TNF-α also augmented PMA-induced T cell adhesion from 25 to 42% (adhesion to FN-complexed TNF-α). Chemokine or PMA-induced T cell adhesion to FN alone or FN coimmobilized with TNF-α was blocked by mAb anti-α4β1 and α5β1 integrins (not shown). Hence, FN-complexed TNF-α, which by itself has no proadhesive effect on T cells, can exert significant adhesion-strengthening signals to T cells exposed to proadhesive chemokines in the context of FN. Regulation of T cell adhesion (A) to and chemotaxis through FN (B) by TNF-α. A, Microtiter well plates were coated with FN, alone or complexed with TNF-α, which was added to the indicated wells for a short incubation; the final amount of TNF-α in such wells was in the range of 35 pg/well. The adhesiveness (±SD) of 51Cr-labeled and PMA-treated (25 ng/ml) or chemokine-activated (100 and 150 ng/ml for RANTES and SDF-1, respectively) T cells (105 cells/well) was determined 60 min after cell seeding. For each experimental group, results were expressed as the mean percentage (±SD) of bound T cells from quadruplicate wells. The percentage of cells that adhered was calculated as follows: (cpm of residual cells in the well/(total cpm of cells added to the well − spontaneous release of 51Cr)) × 100. 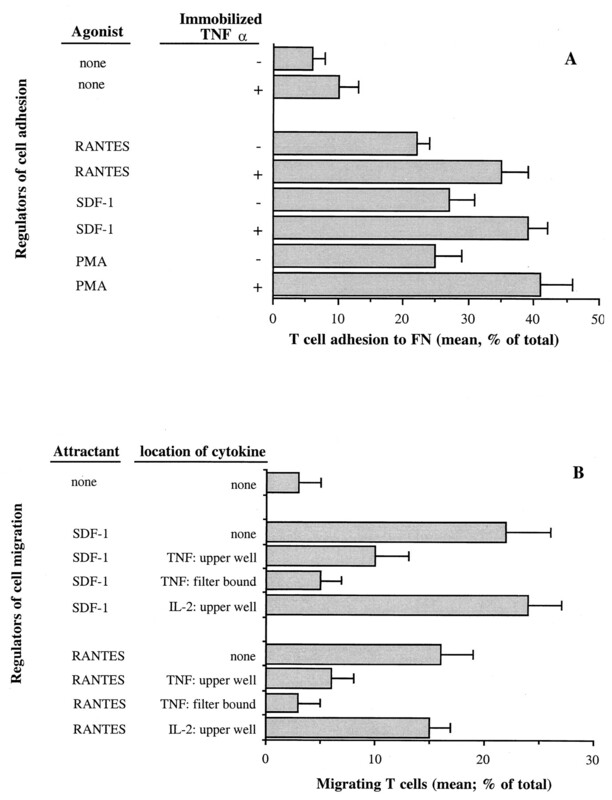 T cell adhesion to TNF-α/FN complexes differs significantly from RANTES-, SDF-1-, and PMA-induced T cell binding to FN alone (p < 0.05). One experiment representative of four is shown. B, CD45RO+ T cells were labeled and applied to the upper chambers of a Transwell apparatus (105 cells/chamber), assembled with a filter precoated with FN (10 μg/ml). TNF-α (250 pg/ml) was added to the upper compartment immediately before the assay (soluble) or was precoated (1 h, 22°C) on the FN-coated filter. RANTES and SDF-1 (100 and 150 ng/ml, respectively) were added to the lower compartments. The percentage of T cell migration was calculated as the total cell-associated radioactivity recovered in the lower wells. The cell population analyzed herein contained >94% CD3+ T cells. For A and B, one experiment representative of three is shown. The combined proadhesive effect of RANTES or SDF-1α in the context of matrix-bound TNF-α involves diverse intracellular activation pathways. In such environments, T cell adhesion was markedly down-regulated in the presence of inhibitor of G protein signaling, pertussis toxin, as well as other inhibitors of key elements involved in integrin-mediated T cell adhesion, such as the PKC inhibitor, GF109203X; the phosphatidylinositol-3 kinase inhibitor, wortmannin; the tyrosine protein kinase inhibitor, genistein; the p38 mitogen-activated protein kinase inhibitor, SB203580; and PD98059, an inhibitor of mitogen-activated protein kinase (data not shown). The ability of TNF-α to augment the chemokine-triggered adhesiveness of CD45RO+ T cells to FN suggests that this cytokine may also modulate the migration of these cells through FN-containing extravascular spaces. Hence, we analyzed the effects of soluble or FN-complexed TNF-α as well as the effects of a control, proadhesive cytokine, IL-2, on T cell migration along RANTES or SDF-1 gradients in conventional chemotaxis chambers. The results indicate that IL-2 does not have any effect on T cell migration toward both chemokines. 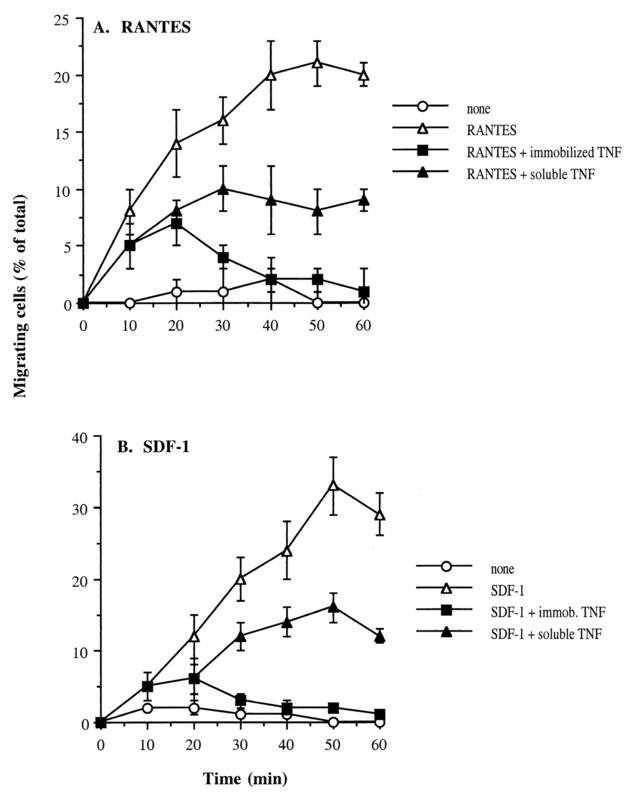 In contrast, soluble TNF-α and, to a greater degree, FN-bound TNF-α significantly inhibit the RANTES- and SDF-1-induced T cell migration (Fig. 1⇑B). Thus, the adhesion-strengthening, integrin-dependent signals transmitted to T cells by FN-interacting TNF-α in the context of proadhesive chemokines interfere with T cell chemotaxis to these chemokines. To examine and analyze the effects of matrix-complexed TNF-α on the migratory properties of individual CD45RO+ T cells, we followed in real time T cell migration within chemotactic gradients formed in 3-D ECM-like gels containing CO, LN, and FN (12). T cell migration along chemotactic gradients of either RANTES or SDF-1 was tracked in intact ECM gel as well as in a gel into which TNF-α had been introduced in different states. A scheme of the setup, depicted in Fig. 2⇓, illustrates the relative positions of the T cells, the migration zone, and the chemokine depot before the beginning of the assay. Scheme of the migration chambers. Drop I contains the purified T cells (150–250 cells), drop II contains the constituents of the migration gel with or without TNF-α (250 pg/ml), and drop III contains the chemoattractant SDF-1 (150 ng/ml) or RANTES (100 ng/ml). The distance between adjacent drops is 1.5 mm. Connection of the drops initiates formation of the chemoattractive gradients and the subsequent migration of the T cells away from the origin. When TNF-α was introduced into the migration zone without the chemoattractant in the depot drop, a significant fraction of the T cells polarized and randomly migrated short distances within the gel (Fig. 3⇓A). Leukocyte polarization is an early activation-dependent event linked to cell adhesion and motility (12, 16). Indeed, most of the T cells embedded in the gel without any cytokine remained spherical and nonmotile throughout the entire assay period. T cell polarization was abrogated by the depletion of the integrin ligands FN and LN from the cytokine-containing gels (12) (data not shown). T cell motility in the ECM-like induced by TNF-α steadily decreased over time (Fig. 3⇓A). This time-dependent effect of TNF-α could reflect changes in the biochemical state of TNF-α within the gel at different time periods. To resolve this question, we immunostained the gels with FN- and TNF-α-specific Ab to monitor the distribution of TNF-α. Within 40–60 min, most of the TNF-α became codistributed with the FN constituent of the gel; both molecules were found to colocalize in fibrillar and globular patterns (Fig. 3⇓C), typical of the structure of FN, which consists of two distinct patterns: dense globular aggregates and thin fibrillar strands. Thus, soluble TNF-α added to the gel can rapidly associate with the FN fibrils. 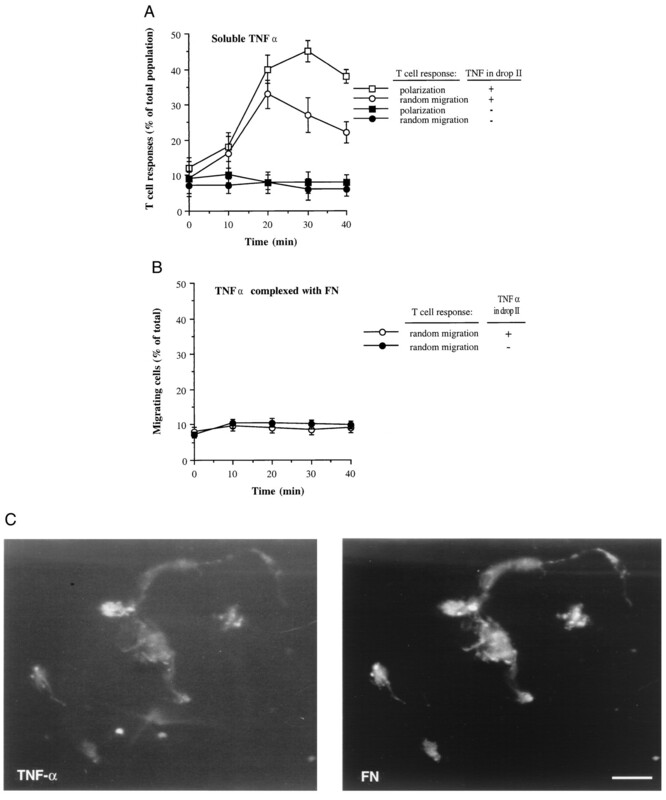 The time-dependent decrease in motility observed in this experiment suggests that T cells respond differently to de novo secreted soluble TNF-α as opposed to FN-complexed TNF-α. Indeed, when FN was precomplexed with TNF-α, and the complex was then added to the LN- and CO-containing gel, the T cells introduced into the gel immediately polarized and remained nonmotile over the entire period of the assay (Fig. 3⇓B). T cell response to ECM-associated TNF-α. Purified human CD45RO+ T cells (250 cells/10 μl of gel) were applied to drop I in the migration chamber and configured as shown in Fig. 2⇑. TNF-α (250 pg/ml) was added to drop II immediately before the beginning of the assay (A). Alternatively, TNF-α and FN were precomplexed, and the complex was reconstituted in drop II (B). Polarization and migratory patterns of T cells were analyzed after connecting the drops. One experiment is shown that is representative of eight different donors. The cell population analyzed contained >95% CD3+ T cells, of which >97% were CD45RO+ cells. The data introduced for each time point are an average analysis of migration of 80–100 cells; the results, at >20 min, in the presence of TNF-α differed significantly from those obtained in the absence of the cytokine, as determined by Student’s t test. C, Double-immunofluorescence staining of TNF-α and FN. ECM gels, which were preincubated with TNF-α (250 pg/ml), were analyzed using mAb to TNF-α (left panel) and polyclonal Ab to human FN (right panel). Each incubation with the Ab was followed by fluorescent staining with FITC-conjugated Ab (for TNF-α) and rhodamine-conjugated Ab (for FN). Note the typical structures of FN: dense globular aggregates and thin fibrillar strands. Photographs were taken at ×400 using appropriate filters. The bar in the lower corner of the right panel equals 50 μm. In light of the profound proadhesive effects of FN-complexed TNF-α on chemokine-stimulated T cells (Fig. 1⇑A), we questioned whether TNF-α introduced into a migratory zone of T cells chemoattracted by specific chemokines can modulate the migration of the cells. To this end, T cells were placed in drop I, the chemokine was added to drop III, and T cell migration within a migration zone of intact ECM-like gel or a gel containing the FN-TNF-α complex (in drop II) was analyzed. First, we assessed the dose-response, chemoattractive effects of RANTES or SDF-1α, present in drop III at the beginning of the assay in the absence or the presence of TNF-α in drop II. The results, shown in Table I⇓, indicate that in the absence of TNF-α, the effective chemoattractive concentrations of SDF-1α and RANTES were 150 and 100 ng/ml, respectively. When TNF-α, at 0.1–1 ng/ml, was prebound in drop II, a marked inhibition of T cell chemotaxis occurred. The amount of 250 pg/ml for TNF-α was chosen based on a previous study in which we found that 4–6% of the soluble TNF-α actually bound FN and elevated the PMA-induced T cell adhesion (11). Further analysis of the chemotactic modulatory properties of TNF-α is shown in Fig. 4⇓. In the absence of TNF-α, RANTES induced a marked directional T cell migration oriented along the developing gradient, within up to 60 min, followed by an apparent decline in T cell migration. This is probably due either to the cells reaching a field of homogeneous dispersion of chemokine molecules within the ECM or to chemokine receptor desensitization (18). When TNF-α was present in the migration zone, an almost complete suppression of T cell migration toward RANTES was observed (Table I⇑ and Fig. 4⇓). The inhibitory effect of TNF-α on migration was not due to the apoptosis-inducing capacities of the cytokine, because the migrating T cells remained intact throughout the studies and thereafter (not shown). To determine whether the migration-inhibiting effect of TNF-α is due solely to its adhesion-strengthening effects on T cells interacting with FN, agonists of β1 integrins, such as PMA or IL-2 (14), were introduced into drop II as control activators. Surprisingly, IL-2 did not alter the proportion of RANTES-induced, directionally migrating T cells. PMA, a powerful PKC activator capable of locking integrins in high-avidity states, reduced the number of T cells migrating toward RANTES, similar to immobilized TNF-α (Fig. 4⇓). Analysis of the RANTES-induced directional migration of T cells in the presence of ECM-associated cytokines or soluble PMA. TNF-α (250 pg/ml), IL-2 (10 U/ml), or PMA (25 ng/ml) were introduced in drop II. 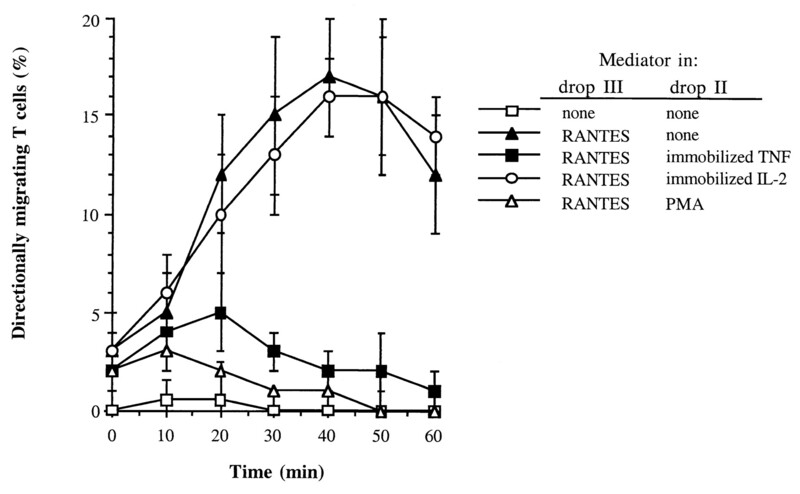 The percentage (±SD) of directly migrating CD45RO+ T cells of the total number of cells tested was analyzed during a 60-min period 15 min after connecting the three drops in the chamber, as explained in Fig. 2⇑. Where indicated, TNF-α or IL-2 (10 U/ml) was precomplexed with FN and then incorporated as a complex into drop II of the gel before connecting the drops. Alternatively, PMA was added to drop II of the gel mixture before the beginning of the assay. The cell population analyzed herein contained >94% CD3+ T cells, of which >97% were CD45RO+ cells. The data introduced for each time point are an average analysis of migration of 85–100 cells; the results, at >20 min, in the presence of IL-2 and in the absence of TNF-α differed significantly (p < 0.05) from those obtained in the presence of TNF-α, as determined by Student’s t test. One experiment representative of six is shown. Next, we compared the capacity of matrix-complexed TNF-α or soluble TNF-α, introduced to the migration zone simultaneously with the generation of chemokine gradient (Fig. 2⇑), to modulate the migratory properties of T cells moving along chemokine gradients. Consistent with the strong inhibitory effect of TNF-α complexed to FN on the directional migration of T cells toward RANTES (Fig. 4⇑), matrix-associated TNF-α, but not the soluble cytokine, abolished the directional migration of T cells along RANTES or SDF-1 gradients (Fig. 5⇓, A and B, respectively). The chemokine- or TNF-α-induced T cell responses in the 3-D gel (e.g., polarization, random and directional movements), within the indicated time frame (10–60 min), were not the result of alterations in the surface expression of the relevant chemokine receptors (i.e., CCR5 and CXCR4) as well as FN-specific β1 integrins, as confirmed by FACS staining of these molecules after T cell exposure to TNF-α for 15–60 min (data not shown). Effects of TNF-α on chemokine-induced T cell chemotaxis. Analysis of the directional migration of T cells (>94% CD3+ T cells, of which >97% were CD45RO+ cells) toward RANTES (A) and SDF-1 (B) source (drop III) in the absence or the presence of either matrix-complexed TNF-α or soluble TNF-α added to drop II (i.e., migration zone) immediately before connecting the drops. The data introduced for each time point are an average analysis of migration of 80–100 cells. At >20 min, the results obtained in the presence of TNF-α (soluble or immobilized) differed significantly (p < 0.05) from those obtained in the absence of the cytokine. One experiment representative of six is shown. A computerized analysis of individual T cells migrating in various chemotactic contexts was performed. Fig. 6⇓ depicts representative pathways of T cell migrating toward RANTES. Whereas no directional migration of T cells was observed in either intact (Fig. 6⇓A) or TNF-α-containing migratory zones without a chemokine gradient (Fig. 6⇓B), highly directional migration of T cells was observed along RANTES gradients, with a high ratio between the vectorial distance and the total distance traveled by an individual cell from the origin of its migratory path (Fig. 6⇓C). Note that T cells located close to the RANTES depot exhibited low migration rates, suggesting that a directional migration requires a chemoattractant gradient rather than a high local concentration of the chemokine. T cells migrating along the RANTES gradient in the presence of matrix-associated TNF-α were highly heterogeneous in their pathways (Fig. 6⇓D). A fraction of the cells migrated short distances in the direction of the RANTES gradient before coming to a complete stop. Another small fraction of T cells migrated long distances toward RANTES, similar to the migratory properties of T cells migrating toward RANTES in the absence of TNF-α (Fig. 6⇓C). A third fraction of T cells retained their ability to migrate directionally toward the chemokine, but their migration paths were shortened in the presence of TNF-α (Fig. 6⇓D). Computerized tracking of individual T cells responding to chemoattractive gradients. A scheme of motion patterns of individual cells (>97% CD3+, CD45RO+ human cells) migrating during the 60-min assay is shown. A, T cell responses in the absence of a chemoattractive source. B, T cell response to matrix-immobilized TNF-α (in drop II). C, T cell response to RANTES introduced in drop III. Note the low mobility of the cells located at the right side of the field closest to the concentrated RANTES depot. D, T cell chemotaxis in response to the developing gradients of RANTES within the migration zone (drop II) containing immobilized TNF-α. One experiment representative of five is shown. An additional microdynamic analysis of individual T cells migrating toward RANTES, in the absence or the presence of TNF-α, was performed with T cells from three donors. Matrix-associated TNF-α markedly decreased both the total distance and the vectorial path lengths of all tested T cells present in the migration zone (Fig. 7⇓A). These significant effects were TNF-α specific, because the total distance traveled by the RANTES-attracted T cells was only minimally reduced if IL-2 was present in the migration zone, instead of TNF-α. Nevertheless, IL-2 in the migration zone significantly reduced the directionality of the RANTES-induced T cell chemotaxis (Fig. 7⇓B and data not shown). The microdynamic analysis revealed that the velocity and directionality of cells moving along RANTES gradients were not significantly altered until being stopped by TNF-α (Fig. 7⇓B). Thus, the shorter distance traveled by cells toward RANTES in the presence of TNF-α was due to the reduction in the duration of migration, rather than to the speed or the directionality of migration. Indeed, the mean duration of T cells migrating toward RANTES dropped from 65 ± 15 min in the absence of TNF-α to 32 ± 4 min in the presence of TNF-α. Similar findings were observed in T cells migrating along SDF-1 gradients; TNF-α reduced the mean duration of directionally migrating cells from 45 ± 5 to 32 ± 7 min. In conclusion, the cell paths depicted in Fig. 7⇓B indicate that the T cells move directionally along the chemotactic gradient until encountering TNF-α-rich areas that rapidly triggered their complete arrest. Thus, TNF-α and IL-2 reduced the directional distances traveled by T cells toward a chemotactic source through distinct mechanisms: TNF-α by stopping a previously migrating cell, and IL-2 by constantly reducing the directionality of the locomoting cell. A dynamic analysis of RANTES- and TNF-α-modulated individual pathways of migrating T cells. Analysis of individual T cells (>97% CD3+, CD45RO+ human cells) migrating toward RANTES, in the absence or the presence of matrix-associated TNF-α, was performed with three donors. A, TNF-α-induced inhibition of the directional path lengths (i.e., vectorial distance traveled in microns; upper panel) and total distance (lower panel) of the tested T cells. B, Individual cell displacement patterns (from the original location of the cell until the cell stopped moving toward the chemotactic source) as a function of time. The upper lines (A and A*) represent T cells migrating toward RANTES. Lines B and B* represent T cell displacement toward RANTES in the presence of an IL-2 depot in the migration zone. Lines C and C* represent the displacement patterns of RANTES-attracted T cells migrating in the presence of matrix-associated TNF-α. TNF-α is recognized by two receptors, designated TNF-αR-I and -II, which, upon ligand binding, transmit differential intracellular signals (10, 19, 20). We examined the contributions of both receptors to the stop signal exerted by FN-bound TNF-α. T cells were pretreated with mAb specific for TNF-αR-I or -II and then introduced into the RANTES-containing gel in the presence of immobilized TNF-α. 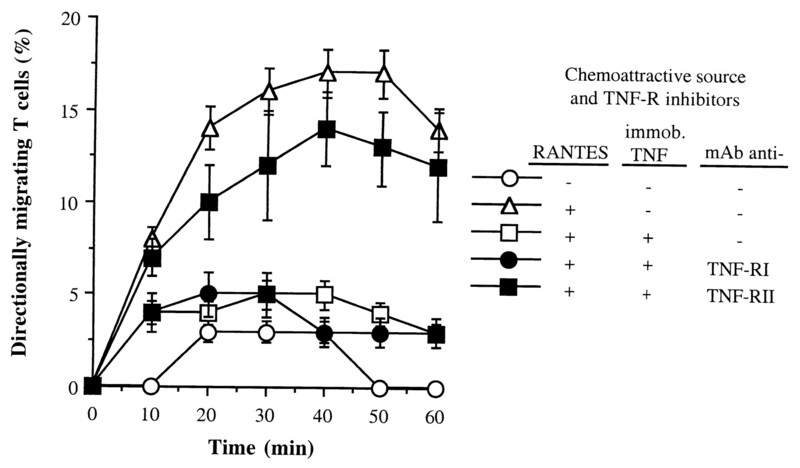 Anti-TNF-RII but not anti-TNF-RI mAb completely abolished the inhibitory capacity of the cytokine on both the number of T cells migrating toward RANTES (Fig. 8⇓) as well as on their directionality of migration, as reflected in the microdynamics of their motions (not shown). Hence, the migration-stopping effect of TNF-α is transmitted to the chemotactically migrating T cells exclusively through their TNF-α-RII subtype. Interestingly, both mAbs blocked the proadhesive effect of this cytokine on chemokine-induced T cell adhesion to FN in a static T cell adhesion assay (not shown). Thus, there is no direct relationship between the proadhesive effects of a cytokine signal mediated by both TNF-α receptors and the unique role of one of these receptors, namely TNF-αR-II, in delivering stoppage signals to the migrating T cells. Analysis of TNF-α receptor subtype involved in the signal provided by TNF-α to RANTES-induced T cell chemotaxis. Purified CD45RO+ human T cells were placed within the migration chamber in the presence of immobilized TNF-α, RANTES, or their combination. Where indicated, the purified human T cells were pretreated with mAb anti-TNF-α-RI or TNF-α-RII. The direct migration of T cells was determined and expressed as the mean percentage (±SD) response of T cells of the total number of cells tested. The data introduced for each time point are an average analysis of migration of at least 80 cells. At >20 min, the results obtained in the absence of TNF-α or in the presence of both TNF-α and mAb anti-TNF-α-RII differed significantly (p < 0.05) from those obtained in the presence of the immobilized cytokine and mAb anti-TNF-RII. One experiment representative of four is shown. The adhesive and migratory functions of leukocytes within the ECM milieu depend on the structure of the matrix and the combined actions of specific chemoattractants and proadhesive cytokines (18, 21, 22). In such a multicomponent environment, a migrating T cell must continuously integrate different signals and adapt its migratory behavior to successfully navigate toward its target site (1, 3). Several recent publications have highlighted the migration-modifying proinflammatory signals transmitted to T cells (23, 24, 25). However, how proadhesive and promigratory cytokines and chemokines interact in transmitting chemotactic migration-altering signals to T cells present within the ECM is still largely ambiguous. Hence, in designing this study we assumed that the migration-altering signals present within the ECM at sites of inflammation are the result of gradual increase in amounts of the very same migration-inducing chemoattractant, locally complexed proadhesive mediators, or both (25, 26, 27, 28). Herein, we developed a system to test for a possible hierarchy of activating signals encountered by tissue-invading T cells by directly following, in real time, the migration of cells simultaneously or sequentially exposed to various ECM-associated mediators (12). We initially observed that FN-complexed TNF-α can suppress the chemotactic migration of human CD45RO+ T cells toward potent chemokines, such as SDF-1 and RANTES in the Transwell system (Fig. 1⇑). Having observed this suppressive effect of TNF-α, we next investigated how the chemotactic navigation of individual T cells is affected by the presence of TNF-α. We found that FN-associated TNF-α, although lacking chemotactic activity of its own (Table I⇑ and Fig. 3⇑), can transmit signals to T cells to stop their migration along chemokine gradients. The mechanism underlying the stoppage effect of TNF-α on T cell migration within ECM is not known. Such stoppage may result from modulation of the expression or rapid activation of ECM-specific adhesion receptors on the migrating leukocytes. However, TNF-α did not alter the expression of β1 integrins (or SDF-1α and RANTES receptors) on T cells during the time frame of the assay or even during longer periods (not shown). In addition, it is unlikely that TNF-α transmits such a rapid stoppage signals to T cells by inducing the de novo biosynthesis of a stoppage factor by the migrating T cells. In light of its ability to strengthen the agonist-induced β1 integrin-mediated adhesion of T cells to FN during this time frame, we propose that the stoppage effect of TNF-α involves modulation of β1 integrin adhesiveness triggered by chemokines during the migratory process. Indeed, T cell adhesion induced by both immobilized TNF-α and chemokines involved diverse intracellular signaling events, which are all linked to the stimulation of β1 integrin avidity and adhesion strengthening (manuscript in preparation). Moreover, adhesion-strengthening effects induced by PMA or integrin-activating mAb also resulted in complete stoppage of T cells present within chemokine gradients (Fig. 4⇑ and data not shown). Interestingly, TNF-α alone failed to strengthen β1 integrin-mediated T cell adhesion both in prolonged static assays (Fig. 1⇑) (11) and during short static contacts, during which chemokines could stimulate cell adhesion (R. Alon, unpublished observation). Hence, TNF-α appears to strengthen cell adhesion primed by chemokine-stimulated integrins, thereby, generating high-avidity interactions with ECM and stoppage of cell motility. Herein, the matrix-complexed TNF-α was found to reduce the motility of T cells and transmit stop signals to chemokine-attracted T cells much more efficiently than the soluble form of the cytokine ( Figs. 3–6⇑⇑⇑⇑). We propose that although the absolute amounts of the FN-bound cytokine are diminutive, the lymphocytes could have actually encountered high localized amounts of the cytokine, as indeed suggested by our FN and TNF-α colocalization findings (Fig. 3⇑C). Is the ability of TNF-α to transmit a stop signal unique to this cytokine? Proadhesive, matrix-associating cytokines were reported to exert antimigratory effects on leukocytes migrating along chemotactic gradients (24). TCR engagement transmitted a stop signal to T cells migrating on ICAM-1 in vitro (23). In contrast, TNF-α differs from most other cytokines in that it does not trigger T cell adhesion or migration on its own, but, rather, strengthens the adhesion triggered by other agonists. The results shown in Figs. 3⇑ and 6⇑ indicate that TNF-α can actually activate T cells in the context of ECM, because it induced T cell chemokinesis and polarization. Yet, as shown in our studies (Figs. 1⇑C, 3, and 6), TNF-α, in its matrix-bound or soluble forms, lacks a detectable chemotactic effect. Consistent with our findings (Fig. 3⇑), it has been previously shown that TNF-α can induce the polarization, but not the locomotion, of neutrophils (29). In contrast to TNF-α, IL-2, a proadhesive and promigratory cytokine by itself (12), which, similar to TNF-α, can interact with ECM proteins (14) and regulate the expression of chemokine receptors on leukocytes (30), did not induce a stoppage effect on T cells (Fig. 4⇑). Thus, we not only could demonstrate that the ability to deliver stoppage signals is unique to TNF-α, but could also show that proadhesive effects and stoppage signals, delivered to ECM-interacting T cells by cytokines, are separately regulated. TNF-α is recognized by TNF-α-RI and -II on various cell types, including leukocytes (19, 31). These two receptors differ not only in their TNF-α-binding capacities and functions, but also in their expression. In contrast to the constitutive level of expression of TNF-RI on leukocytes, the expression of TNF-RII requires cell activation (10). Our results suggest that TNF-RII on activated CD45RO+ T cells is the TNF-α-R that exclusively mediates the cytokine’s capacity to stop T cell migration. This may be due to the preferential binding of FN-complexed TNF-α, rather than soluble TNF-α, to TNF-RII. Interestingly, TNF-RII, but not TNF-RI, modulates the migration of epidermal Langerhans cells in vivo (32). Chemoattractive gradients and proinflammatory cytokines can be continuously formed by tissue-resident, as well as newly invasive, immunocytes (18, 32, 33, 34, 35). The migration of T cells in tissues may be directly induced by chemoattractive cytokines or bacterial Ags (25, 27) or indirectly induced by the capacity of cytokines to stimulate the secretion of promigratory mediators for lymphocytes by various cells at the site of inflammation (36). Our study simulated an inflammatory scenario within an ECM-like environment in which T cells were attracted by a de novo generated chemoattractant gradient encountered within a migratory zone into which TNF-α had been previously deposited. This scenario assumes that TNF-α became associated with the ECM before the chemokine gradient was formed. It would then function as a strong and rapid adhesion-strengthening moiety (37, 38) and anchor the chemoattracted T cells at these sites. The idea that some chemoattractants may inhibit chemotactic migration induced by other attractants has been recently suggested and studied by Butcher et al. (8, 9). Pre-exposure of leukocytes to a dominant attractant, such as the peptide fMLP, strongly suppressed the ability of these cells to migrate, in a non-ECM context, toward a secondary and weaker chemoattractant, IL-8. Butcher et al. proposed that leukocytes navigate in the tissue by responding to a complex chemoattractant field in a step-by-step manner, such that their ultimate positions are determined by the sequence of chemoattractive information encountered during their migration. Our results extend this idea in that not only do different attractants control the navigation of cells to other attractants at the site of inflammation, but nonmigratory cytokines can also regulate the final localization of lymphocytes at chemotactic fields. Therefore, the type of cytokine, its amount, its context, and the order of presentation to the migrating leukocyte may determine the ultimate position of the locomoting cell within tissue. This information is translated within the responding T cell to directional migration, random movement (chemokinesis), or arrest. Migration involves the regulated function of cytoskeletal elements and integrins (39, 40). The relationship between proadhesive information and motility is complex; optimal cell motility requires a medium level of avidity between the migrating cell and adhesive proteins in the migration matrix (15, 39). Therefore, it is difficult to predict how a cytokine with both proadhesive and chemokinetic properties would determine T cell motility in a given environment. An intriguing possibility raised by our findings of the unique stoppage signals transmitted by TNF-α, but not by IL-2, is the existence of a hierarchy between different types of nonchemotactic cytokines with respect to their abilities to modulate T cell migration in a chemotactic context. Future studies should be aimed at examining the possibility that other inflammatory cytokines can also inhibit T cell chemotaxis. In this respect it has been found that a prolonged incubation (i.e., 4–20 h) of monocytes with bacterial Ags or IFN-γ blocks their migration on a monocyte chemoattractant protein-1-formed chemotactic gradient by selectively down-regulating the expression of the monocyte chemoattractant protein-1 receptor CCR2 (41, 42). However, the mechanism underlying the rapid stoppage effect of TNF-α cannot be attributed to modulation of chemokine or integrin receptor expression. It is also reasonable to assume that this mode of rapid T cell activation by TNF-α is not sufficient to affect gene transcription or RNA translation of these receptors. A putative role for TNF-α secreted and integrated into the ECM at sites of inflammation may be to anchor momentarily the directional migration of T cells to these sites, where their effector functions are required. Such an anchorage of T cells by ECM-complexed TNF-α may be regarded as a checkpoint in activation processes of the migrating lymphocytes (23). The in vivo consequences of such stoppage may be either proinflammatory (e.g., retention of immune cells) or suppressive (e.g., attenuating excess recruitment of effector cells), depending on the context of chemoattractive information presented to the locomoting cells within the specific ECM microenvironment. We thank David Wallach, Irun R. Cohen, and Lee A. Segel (The Weizmann Institute of Science) for their valuable suggestions and critiques. ↵1 This work was supported by research grants from the Israel Cancer Research Fund, The Robert Koch-Minnerva Center for Research in Autoimmune Diseases (The Weizmann Institute), and the Center for the Study of Emerging Diseases (Jerusalem, Israel; to O.L. ), as well as by The Minnerva Foundation (Germany; to R.A.). O.L. is the incumbent of the Weizmann League Career Development Chair in Children’s Diseases. R.A. is the incumbent of the Tauro Career Development Chair. S.F. is a recipient of the Stifterverband Fellowship für die Deutsche Wissenschaft, donated by Drs. Alexander and Rita Besser-Stiftung. 3 Abbreviations used in this paper: ECM, extracellular matrix; 3-D, three-dimensional; CO, collagen; FN, fibronectin; LN, laminin; SDF-1α, stromal cell-derived factor-1α; PKC, protein kinase C.
Segel, L. A.. 1984. Modeling Dynamic Phenomena in Molecular and Cellular Biology Cambridge University Press, Cambridge.